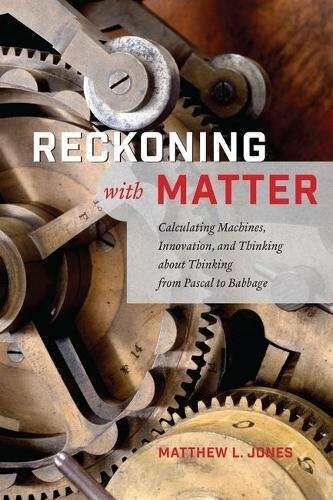 Reckoning with Matter focuses on two inventors Blaise Pascal and Charles Babbage, and their efforts in the invention and construction of mechanical calculators. Author and historian Mathew L. Jones informs readers, “The contributions of artisans . . . are often hidden from historians; most interactions occurred face-to-face and left few unambiguous traces.” But luckily for us, Pascal and Babbage were famous in their own time; a historical record of their work has been preserved. Babbage and Pascal were separated by two hundred years. In Pascal’s era, computation was regarded as low status as it was evidence the mind could be reduced to following rules. Few found value in the effort to create machinery to aid calculation. The primary challenge in inventing a mechanical calculator was the “carry” operation. For example, the rules of addition affect each digit in turn, one plus nine equals zero, with a carry into the tens place. This rule is easy to for a human to memorize but is difficult for a human to mechanize, for example with 999 plus one equals 1000, the carry affects three digits at the same time. Jones notes, “In every case, philosopher-inventors underestimated the challenge of mechanizing carry.” In a touch of dry humor, Jones titles the book’s chapters, First Carry, Second Carry, Third Carry, and Fourth Carry. Pascal solved the problem of carry by use of springs and toothed levers. His calculating machine, the “Pascaline,” was costly to manufacture, difficult to use, and limited in what it could do. The wheels could only turn in one direction so it could only add but not subtract. The Pascaline however was the first of its kind and became of such interest it garnered an entry into Diderot’s Encyclopédie, the world’s first encyclopedia. Throughout Reckoning with Matter are exquisite illustrations such as a drawing of the Pascaline from the Encyclopédie. Another challenge to invention in Pascal’s era was social class. It was not proper for a philosopher-inventor to lower himself to work along side artisans and craftsmen. Yet the inventor had to do this, to understand the unique problems of construction. Indeed, the invention of the calculating machine required a convergence of theory and skill, and that convergence required a disregard of social convention. Pascal was not the only inventor of calculating machines; one of his famous contemporaries and competitors was Gottfried Wilhelm Leibniz. Leibniz faced similar challenges as Pascal. Leibniz hired an artisan to produce a calculator, and contracted manufacture to be completed in three weeks. The calculator’s construction took 40 years, cost a small fortune, and was still not working by the time Leibniz died in 1716. Though Leibniz failed in his attempt to create a working calculating machine, he did succeed in creating a non-working prototype that he successfully demonstrated to the Royal Society in London. The prototype was successful in that it served as inspiration. That someone as famous as Leibniz failed made it a tempting goal. A few weeks after Leibniz’s demonstration, Robert Hooke demonstrated a model of his own, an improved copy of Leibniz’s machine. Jones notes that Hooke didn’t copy so much as master the essentials to do Leibniz one better. Inventors of Pascal’s era were no different in having to contend with untrained copyists selling unlicensed copies, and a Pascaline knockoff back then would be just as desirable as a knockoff Coach bag is today. There were patents in the 1600s but they were different from today in that patents were given through royal grant as encouragement to innovate, and neither working model nor specification were required to file. Pascal asked for and received a patent from the king of France that gave him a monopoly for calculating machines. This patent further specified unapproved machines would be seized and producing artisans fired, and Pascal received his patent independent of his machine actually working. Though acquiring patents for non-working models was the norm, Pascal’s patent was unique in that his patent had protection for an unlimited duration. Jones believes Pascal’s patent likely to be not enforced if push came to shove, as the patent was a favor, given by an official in government in repayment for a debt owed Pascal’s father. Jones believes the patent’s terms would be revisited if the Pascaline became profitable. Jones expands on the notion of patents in France in the context of politics—there were competing interests in France between the government, inventors, and artisan guilds. There was no such thing intellectual property law because there was no legal infrastructure to support it; there was not yet a patent system. Jones claims this era was a free-for-all of intellectual poaching, industrial substitution and industrial espionage. Though perhaps is not so different from today, despite modern law. Between the eras of Pascal and Babbage, there were more inventors. In 1773, in Germany, Philipp Matthäus Hahn and Johann Müller independently created similar calculating machines; as an innovation, Müller’s has a mechanism for typesetting results for printing. In 1780, in the U.K., Charles Mahon Stanhope constructed a functioning model of a calculating machine. He developed plans for reducing costs for manufacture and increasing robustness of design though he never took these steps, nor did he publish or patent his designs. Instead, Stanhope moved on, attempting to mechanize logic. In the 1820s, in the U.K., Charles Babbage has many of the technical and social problems as Pascal did in France, 200 years before. Babbage was well funded, at least at the start. Babbage received government sponsorship after a publicity campaign that included support from the Royal Society. He was granted 1500 pounds by the U.K. government, and the amount was raised to 15,000 pounds though with no promise of continued support. There was great skepticism within the U.K. government; Jones indicates that the sponsoring agency needed some assurance that Babbage wasn’t self-deluded. Although Jones does not provide readers a conversion of pounds to dollars, an Internet search shows the value of Babbage’s award to be today worth more than one million inflation adjusted dollars. To secure funding Babbage needed to claim novelty, and though he initially claimed to be unaware of any previous inventors, his claim soon came under scrutiny. Babbage then began a serious investigation. Of the closest to what he was looking for was Charles Mahon Stanhope’s calculating machine and Müller’s mechanism for printing results. Both Stanhope and Müller were deceased but Babbage met with Stanhope’s son who was then a member in the House of Lords. At some point (the record is not clear) Babbage acquired two of Stanhope’s calculators. Babbage started but never completed two different types of calculating machines. The first he called the “difference engine,” and some of the mechanisms for the difference engine were not innovations but borrowed or independently reinvented. As for the carry mechanism, Babbage implemented the carry through by use of a spring-loaded roller that rolled along hemispherical notches (scalloped bumps) on disks. The industrial revolution had not yet made its effect on machine tools, and Babbage was forced to spend a significant amount of time, money, and effort into creating new tools to machine precision parts. Babbage’s chief engineer Joseph Clement kept ten men busy on machine tooling, parts, and drawings. Babbage’s difference engine foundered in 1834 over the question of who owned the tools: Babbage, Clement, or the government. At this point, all that had been completed of the difference engine were plans, demonstration parts, and a 1/7th scale demonstration machine. Despite a lack of funds, Babbage completed plans for a second version of the difference engine, which was built more than 150 years later using modern machinery to tolerances achievable with metals approximating what was available then. The first error-free calculation made by the difference engine was performed in 1991, close to Babbage’s 200th birthday, and the machine now sits in the Museum of Science in London. After the collapse of the difference engine project, Babbage began studies for a more general-purpose computer he called the “analytical engine.” This machine was more than a calculator, it was a computer that was to be programmed by using “punch cards” similar to those used to program the Jacquard Loom, a complex programmable industrial fabrics weaving machine. Though financial support ended in 1834, Babbage continued on and off working on the analytical engine until 1842. This reviewer has several issues with Reckoning with Matter. Surprisingly, the need for calculation is not addressed until page 98, and though the subtitle of Reckoning with Matter indicates that one of the book’s themes is “thinking about thinking,” the material on thinking is pretty thin. Though Jones points out the differences in patent law—then and now, he passes over other significant social factors that impact invention—then and now, such as sources of funding, machine tools, “deskilling” in manufacturing, the conflict between theory and skill, and dysfunctional organizational behavior. And one last thing: How can this reviewer put it? How can anyone in this century write about Babbage without also something about Ada Lovelace, Babbage’s helpmeet and the world’s first software programmer? Reckoning with Matter has numerous illustrations and 60 pages of endnotes.